Experimenting with a recipe sometimes works, and is sometimes a disaster. Thankfully this Strawberry Shortcake Cake came out just like I wanted it to! Cream 9 tablespoons butter with the sugar until light and fluffy. Add eggs one at a time, mixing well each time. Add sour cream and vanilla and mix until combined. Add sifted dry ingredients and mix on low speed until just barely combined. Pour 1/2 the batter into greased and floured 9-inch square (2" deep) cake pan. Top with mashed strawberries then carefully top the berries with the remaining batter. Bake at 350 degrees for 45 to 50 minutes, or until cooked through (toothpick inserted in center comes out clean). Remove from oven and allow it to rest. 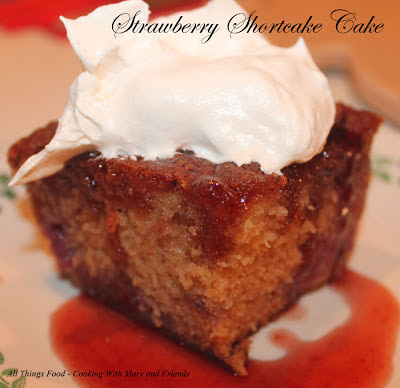 While warm, poke holes in the cake with a large fork and spoon 1/2 cup Strawberry Glaze over cake, reserving remaining 1/2 cup glaze to serve with the cake. Cool completely. Cut cake into serving pieces, drizzle more Strawberry Glaze over each piece and top with a large dollop of whipped cream.